Phoenix Rising is an interactive fire sculpture designed to feature as a major art piece at Burning Man in August 2019, and slated to travel to FreezerBurn Texas and Glastonbury Festival UK in 2020. 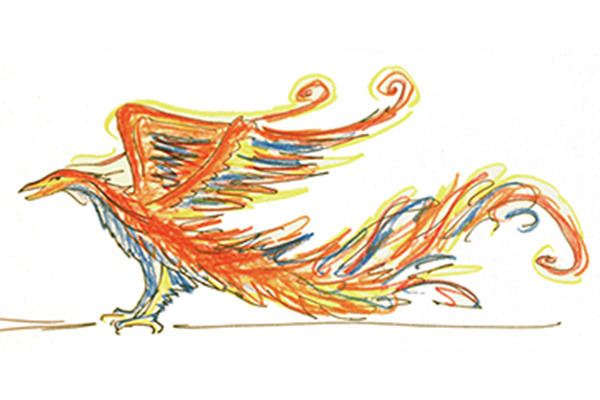 Phoenix Rising will look much like the mythical bird- a hybrid between rooster and peacock. 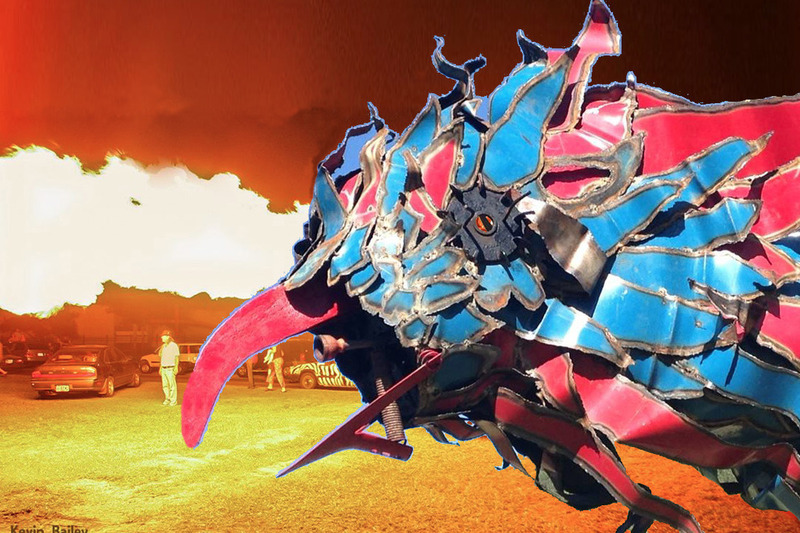 Made of steel and repurposed objects, she will contain a flame-thrower and fire effects system so that visually one will see and feel the heat of a giant Bird on FIRE! FZBTX has provided Phoenix Rising with a nominal grant, yet additional funds are needed which will be allocated to refurbishing the existing parts and creating and installing the sculpture’s Fire Effects System. This will include the purchase of materials such as propane hoses, tanks, pipes, fittings, and gauges; and assist with transport expenses to several events in 2019 and 2020. Your kind donation will also aid in building the infrastructure we dream of, one which provides a harmonious experience of collaboration where talented, skilled, and like-minded people join forces to bring this long held vision to fruition. System #1 — Flamethrower to the Phoenix mouth, design by Aaron "Wheelgunner" Castro. Fuel storage vessel a 100gal propane tank. A system of copper pipes linked together containing a series of holes wrapped with stainless steel wool. Fueled by propane and forced air. Fuel storage vessel a 100gal propane tank. + Ignition Buttons located at a distance from the sculpture for participant access. Gaspo has designed an interactive element to the fire effects system which includes the placement of a pulse sensor on the finger of the festival participant. 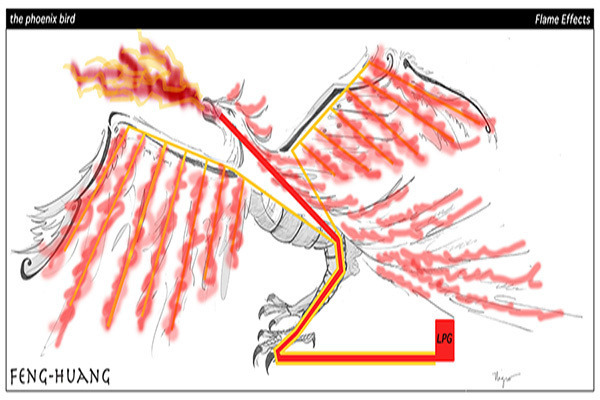 This remotely triggers a signal to the sculpture’s flame effects system and causes the flames of the Phoenix to pulse in unison with the beat of the participant’s heart. It will be exciting to see citizens of Black Rock City and attendees at other festivals experience the rush of one's own heartbeat pulsing through the Fire of the Phoenix! The Phoenix is currently in production mode -Just before the new year, we began deconstructing to reconstruct the sculpture which has sat dormant for four years after attending Apogaea Festival in Bailey, Colorado in 2014. The central structure for accepting the wings and feet has been re-designed, the body of the bird is being reinforced, and new feathers are being cut to replace the old that are rusty or damaged. 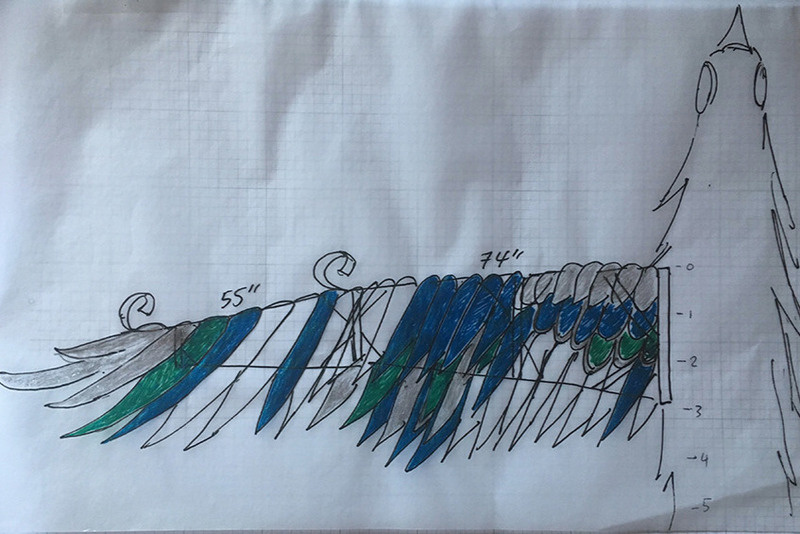 A new design for the wings has been implemented to include removable panels for the feathers. This will allow for easy install and also room for the flame effects system. 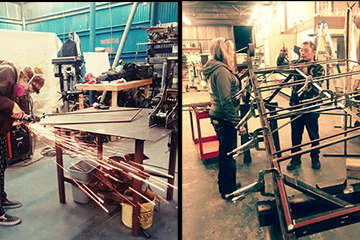 The new wings structures are nearly complete, and feather cutting/making is underway with the assistance of Vanessa Colon. Here we are at work on the wing panels at 10bitworks Maker Space (left: Vanessa Colon. Right: Lisa Nigro & Luis Rojas). Help us MAKE ART HAPPEN! Donate Today! Any amount of assistance on your behalf will be most appreciated. For further information please CLICK PHOENIX RISING! Left: the wing panels close to completion. Right: Feather cut-outs from colorful 55 gal steel drums. 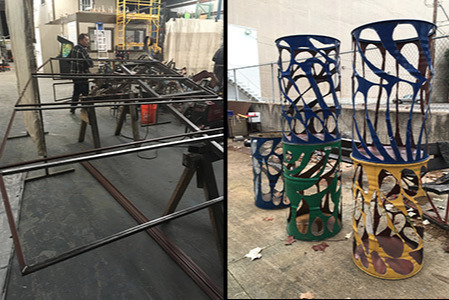 Donated by Dave the Barrel Man, they will be stacked & assembled into "light towers" which will surround and help illuminate the sculpture. The inspiration for this piece is based on our need as humans to shed our skin, destroy what is old and regenerate through the mythos of the Phoenix Rising from it’s own ashes to reemerge anew... Historically, “Feng Huang” are mythological birds of East Asia that reign over all other birds. The males are called Feng and the females Huang. In modern times, however, such a distinction of gender is often no longer made, and they are blurred into a single feminine entity so that the Phoenix is now paired with the Chinese dragon, which is deemed male. So, the piece also addresses the topic of gender inequality in these current times of chaos in our country. Dedicated to loved ones who perhaps passed before their time due to illness, or suicide; and especially to those we've lost most recently from our Burning Man community, Larry Harvey, Dana Harrison, Joy Orbella, and so many others from BM-DPW: Tex, Shooter, Johnny Blue Eyes, Eric... Tom Kennedy... Their spirits are held close in our hearts as this Phoenix Rises from the ashes and pulses anew. This installation is being resurrected not only for participant interaction, but also for the experience of collaborating with others, passing on skills and knowledge in a communal atmosphere, and bringing creative expression to fruition.